Today we have a winner who has already responded! This evening our young grandson was visiting and asked to be the one to draw the name out of the basket, so at 5:00 PM EST that is what happened. 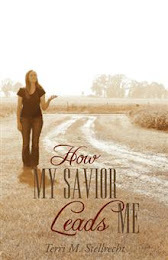 The winner receives the copy of How My Savior Leads Me by Terri M. Stellrecht, generously donated by the author for one of my readers to win. Thank you, Terri. So … congratulations to Rebecca Carney who replied: “Thank you so much!! I look forward to reading this book.” I will put the book into the mail this week for you, Rebecca.